Made of 100% food grade silicone, BPA free and FDA approved. No small and nontoxic, can be touched food directly, keep you and your family health. Applicable temperature : -22 to 480 degree Fahrenheit. Easy cleaning: simply hand-wash our silicone trivet or toss it into the dishwasher. Roll up and store away . Keep your hands safe while handling hot pans,dishes and pots from the oven or stove. 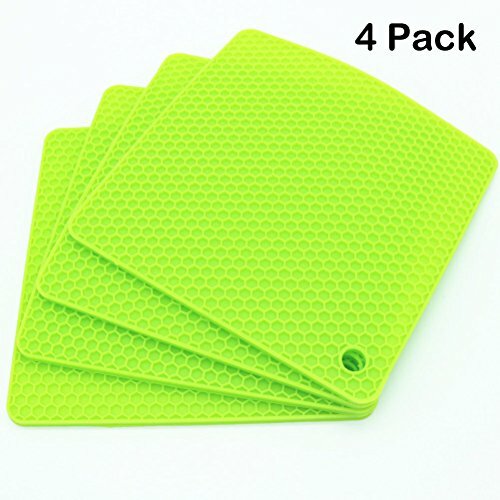 Can be used as trivet, table mats,hot pads, placemat, countertop mat, workshop protector, drying mat,jar opener, table coaster,spoon rest,and garlic peeler or other hot things. Protects stove top, table top,workshop or counter top from unsightly burns. ----- Don't heat it directly by fire and don't scratch it with sharp things. size 7x7 Inch,Weight:330g per set(thicker and weighter than others). you need extra grip or exteme heat or cold protection. from -20 to +480 degrees Fahrenheit, perfect for use in a microwave, or freezer. As a protector for countertop, table, stove,oven or others. If you have any questions about this product by Smithcraft, contact us by completing and submitting the form below. If you are looking for a specif part number, please include it with your message.